Harmony is what Fall is all about. With a beautiful array of colors that all work together to create a perfect harmony. This wall quilt/table topper is a fast and easy quilt to make. 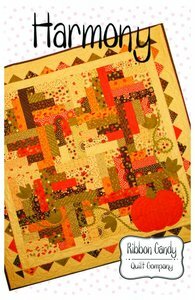 It’s a great pattern for all levels of quilters. Perfect for jelly rolls or stash buster! Make it with the fusible web pumpkin applique or not, and use bright, spring colors for a totally different look.